At Maple Ridge Eye Care, we strive to meet all of your eye and vision care needs and our optometrists have expert knowledge on providing you with the correct contact lens for your clearest and most comfortable vision. 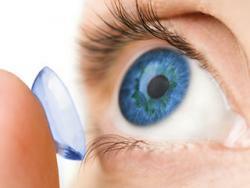 During your eye health exam, your optometrist will work to determine if the eye is ready for contact lenses. This includes checking the back of the eye retina), the visual acuity, the tear ﬂow and of course the cornea (front surface of the eye) where the contact lens will rest. Prior to prescribing contact lenses, the optometrist will determine what level of vision correction you require. Refractive error (commonly known as nearsightedness, farsightedness, or astigmatism depending on the error) is evaluated by measuring how the eyes focus when a series of different lenses are placed in front of them. Our optometrist may use either a phoropter or an automated instrument to take these measurements. To schedule an appointment for a vision evaluation with our Maple Ridge optometrist, call 604-463-4469 today. Your eye doctor will then discuss the eye exam analysis and any vision disorders such as far sightedness, astigmatism or presbyopia. They will discuss case history, previous contact lens wearing experience, previous and current contact lens materials and types as well as new options available to offer extended wear, enhanced comfort, ultra violet protection, crisper, sharper vision and daily convenience. Specialty contact lenses, such as bifocal contact lenses, are also available for patients with special eye conditions. The eye doctor will recommend the contact lens best suited to your lifestyle, your visual needs and your eye health requirements. Patients who wear contact lenses, whether it be full time or only occasionally, require extra eye health testing and counselling on the proper care and maintenance of their lenses. All contact lens wearers are charged a $30 contact lens exam fee, which will then be applied to their annual supply of contact lenses if purchased from our practice.